Earlier this week I blogged on the upcoming ABN AMRO YP launch. Well, today's the day. In short, the opening event is a simulcast with DJ Jesse Voorn (Jesse Bourne) performing life in the Panama Club in Amsterdam and in Second Life. 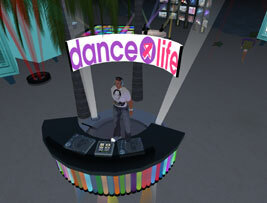 It's also a Dance4Life party. I won't go into details on the background much since I've blogged that here. Anyway, the sim's open now and here are some pics. I see I need to mention a bit of background still to explain it. 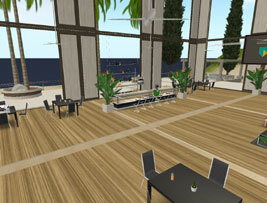 The sim is intended for Young Professionals. The idea behind the build is a relaxed mediterranean village with harbor, a place where Young Professionals would like to hang out. The sim's core is a mediterranean village with some nice houses, a harbor and several meeting points like bars, pools and conference center. According to the Dutch Lost in the Magic Forest the build had to be realised in just one week. All buildings are custom made meeting the quality standards whe'd expect from LitMF (both architecturally and texturally speaking), though a number of props like yaughts and furniture were bought. 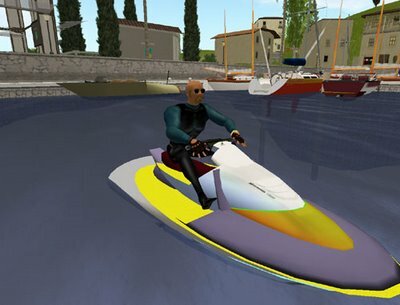 One of the sims fun things is the Mocassin 1200 Jetski ride (okay, here's a pic from me without the usual business suit). It's strong engine propelled me rapidly forward, causing me to bump into several yaughts and even launched me onto the dance site knocking over a few early dancers. 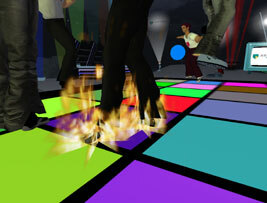 The Dutch partyscene raced out to be there (many Dutch SL club owners were present as well), and I must say, the party was well organised and every possible dance was prepped, I even saw the "feet of flame". 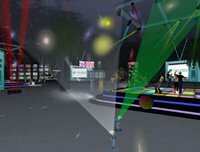 Some minor glitches, such as partybubbles that were causing some lag were quickly disabled before the real event started. 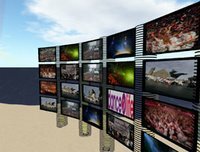 Truth be told, it remained quite laggy at times causing a hard time for the streaming media to render properly, but the crowd liked it. 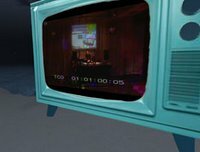 Finally the audio stream was disabled and both image and sound were streamed through the movie, but the soundquality was less than that of the audio stream. 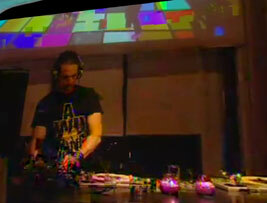 All in all I must say the load of the dancefloor, dancers, the sim and the streaming media was too heavy. Sound fell away quite often and it was hard to get a decent snapshout without the stream being blocky. One of the things nagging me is that the vid stream onlty showed DJ Jesse and SL images, but no images from the Panama Club crowd.